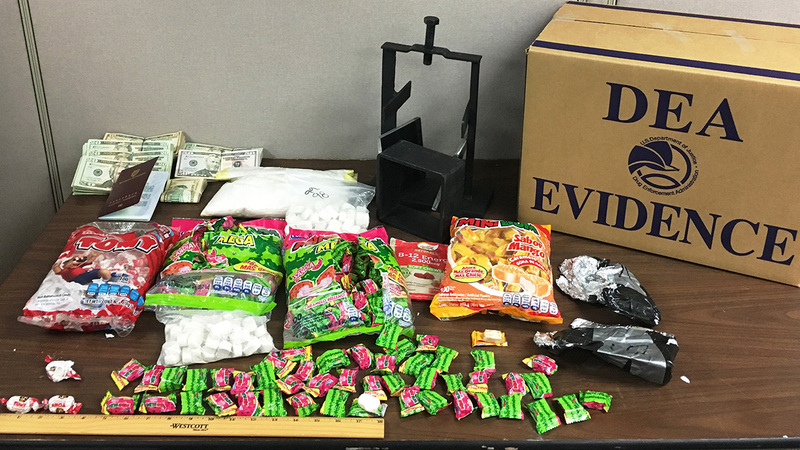 JACKSON HEIGHTS, Queens (WABC) -- A 47-year-old Queens man is under arrest, accused of having nearly $2 million worth of cocaine concealed as individually wrapped candies. Authorities say members of the New York Drug Enforcement Task Force were conducting surveillance near the corner of 77th Street and Northern Boulevard in Jackson Heights when they observed Juan Pablo Martinez exiting a building carrying what appeared to be a heavy black backpack. They followed Martinez as he climbed onto a bicycle and rode to a gas station, where they say he approached the driver of a gray Acura, placed the backpack onto the rear seat and pumped gas for the vehicle. He then removed the backpack, according to prosecutors. Agents and officers approached the vehicle, identifying themselves as police officers, and Martinez reportedly showed them what appeared to be a piece of candy that he pulled out of the backpack. He allowed the agents examine the bag's contents, and they say closer inspection revealed the candy wrappers contained cocaine. Officials say Martinez was carrying two kilograms of cocaine and was arrested. Authorities then searched Martinez's residence, where they reportedly found two additional kilograms of cocaine packaged as candy, a kilogram of powdered cocaine, a kilo press, drug ledgers and $12,000 in cash. Martinez is charged with four counts of criminal possession of a controlled substance.